“It is evident that the consecration (of Russia) was not carried out in the manner requested by Our Lady,” said Vatican Cardinal Raymond Burke in his keynote address marking the highlight and conclusion of the Fatima Centennial Summit held over the weekend. With some 700 attendees, the conference was the largest Fatima centennial celebration in North America. 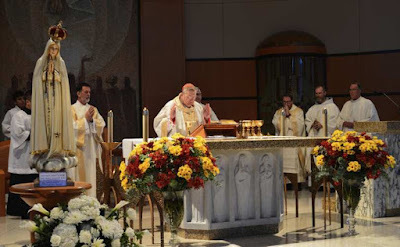 To a standing ovation both before and after he spoke, Cardinal Burke delved deeply into the message of Our Lady of Fatima, her predictions and the consequences of failing to heed her warnings to the world. The Cardinal drew a direct line from the famous Third Secret of Fatima’s dire predictions for the massacre of priests, religious and the death of the Pope to the current crisis in the Church. “Let us not give way to discouragement but rather remember that the Immaculate Heart of the Blessed Virgin Mary assumed into glory, never ceases to beat with love for us, the children Her Divine Son gave to Her as He was dying on the cross,” he said. Organized by Catholic Action, videos from the conference will in time be made available on its website. A long road to Tradition by "3 DAYS OF DARKNESS"
Fr. Voigt, "Whatever happened to Truth?" Fr. Campbell, "Freedom to Follow Christ the King"
Benedict XVI is in great health! List of Masons in the Roman Catholic Church? Trudeau Publicly Declares Himself a Catholic!!!! (PICTURES) TORONTO JUST MADE GOD'S "HIT LIST"